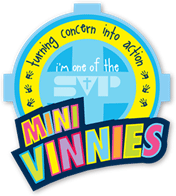 ‘Mini Vinnies’ is the name for a St Vincent de Paul Group for primary aged children. We get together to organise and talk about helping others in need within our school community of Twickenham. Mini Vinnies’ at St. James's meet once a week on a Friday breaktime. Mr Wasmuth co-ordinates the group and gives help and advice on the practicalities of ideas. Group members then talk about the Mini Vinnies' activities they have done since the previous meeting. Any future plans are then discussed, shared and auctioned. Please see below this term's first children's newsletter written by the Year 6 R.E captains. The newsletter highlights the amazing charity events the children, parents and staff have supported both near and far. A fantastic effort, thank you.